Order Early for Easter & Save $10 off $49.99+ with code EASTERSAVE. Save on Send Get Well Wishes with Fresh Flowers to Brighten Their Spirits. Take 15% off Same Day Sympathy Flowers. How to Use 1800 Flowers Coupon Codes? Do you know that every week 1800 Flowers comes up with lucrative offers? Interested to know the same for this week? Avail 15% off on all 1800 Flowers order for premium accounts. Let's know how to use the 1800 Flowers promo code, deals and coupons the easiest way? 1. On the home page, select your desired date, address and occasion to find what are the best matches on these parameters. Otherwise, just search on the top search bar or select the desired type from the homepage. 2. You will be redirected to the respective service page. Each 1800 Flowers product is shown with the name, price and estimated delivery date. 3. Select the one you love the most. On the single product page, you will get to see a short product description, number of flowers or chocolates, product information and your address box, location type and delivery date. 4. Once you fill up these fields, some relevant add-ons will be shown. 5. 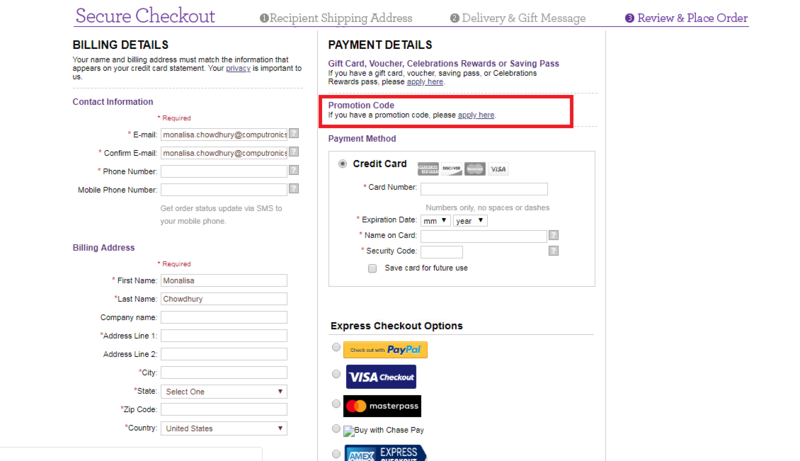 Click on the purple 'Add to Cart' button which will take you to the 'Checkout' page. 6. Here you need to log in if you were not beforehand. 7. Next, you need to input 'Recipient Shipping Address' and then you will be redirected to a page for 'Gift Messages'. 8. From there, you will be redirected to the 'Review & Place Order' where there will be the option to add 'Promotion Code'. How to Save from 1800 Flowers? Use the code "SAVETWENTY" and avail flat 20% discount on all flowers and gifts on 1800 Flowers. "RMNTEN" is one more 1800 Flowers coupon code that offers flat $10 discount on orders over $49.99. Here's one more for you that you can avail even without any 1800 Flowers coupons or promo codes. Pay exactly half amount on your birthday and gift yourself plush stuffed animals, Stunning flower arrangements and various gourmet treats. With 1800 Flowers discount code 'FLWR10', avail flat $10 off on orders over $59.99. 2 more added benefits are 'Same-Day Flowers and Gifts Collection' and 'Last Minute Gifts & Flowers'. Avail an additional 15% off on same-day orders with the coupon code 'SMEDY15'. Flowers 1800 'Last Minute Gifts & Flowers' is for the last-minute arrangement in an incredibly beautiful way with roses, sunflowers, lilies, daisies, and mixed-flower bouquets. These bouquets are arranged by the local florists so that your special day celebration can start as soon as possible. At present, more than 4000 employees work at 1800 Flowers. 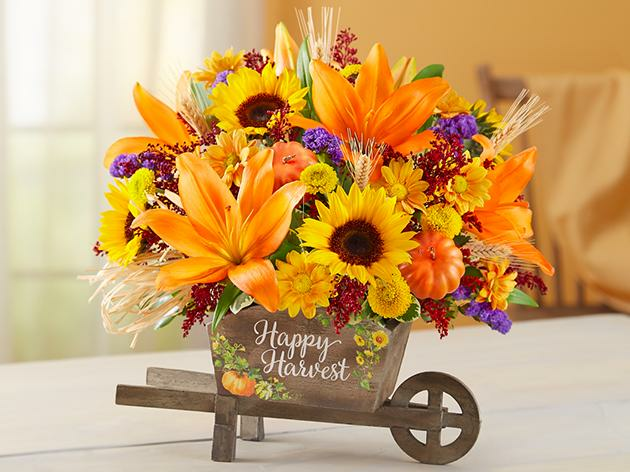 Jim McCann had started this business with 40 years of familial experience in floriculture. Since 2007, 1800 Flowers is the official partner of Martha Stewart Living Omnimedia Inc. (MSO) for exclusive Martha Helen Stewart premium series of flowers. Save special with special persons on 1800 Flowers. Avail an extra 30% off with your VetRewards Card Member ID and the coupon code 'VETERAN4' if you are retired military, U.S. active duty, National Guard, Reserve or Veterans. Did you know that 'Annual Sunflower Festival' is going on at 1800 Flowers? Yes, save up to 45% at the final checkout! Up to 50% OFF from 1800Flowers 26 Coupon Codes. When it comes down to 24/7 customer support on food, flower and gourmet industry, USA reminds 1800 Flowers on the first go. After all, they are the one who has first coined a day and night toll-free helpline number. Not only this, but also 1800 Flowers has always been advanced in comparison with its contemporaries in online selling, chatbots communication, and Conversational commerce. The phoneword name '1800 flowers' has been coined by William Alexander at the introduction of the 1980s. 1800 Flowers has been founded by James McCann in the year 1982. 1800 Flowers has the headquarter in Carle Place, New York, USA. 1800 flowers is mostly praised for its multi-slot, fast same-day delivery on flowers, wine gift baskets, and gifts delivery. Mother's Day is the highest selling day for 1800 Flowers. Each year, 1800 Flowers sell more than 4 Millions of flower bouquets and gift items. Last year, this count reached 5.4 Million marking it as the highest selling flower on a holiday. The business ratio of 1800 Flowers is 30:70 respectively of order by telephone and online. You can call 1800 Flowers is the epitome of codes and coupon cards. At this moment, 1800 Flowers is providing with absolutely free shipping on a wide range of flowers and gourmet foods with the coupon code 'COMPSHIP' on a minimum order value of $14.99. avail free shipping on next-day delivery for every occasion like birthday, anniversary, baby shower, office party and what not! 1800 Flowers next-day delivery just does not limit to Flower bouquets but also money trees, chocolates, teddy bears, bonsai trees, bamboo tree and what not! Each delivery is topped with premium 1800 Flowers 'maintenance instructions' that will keep the gift items fresh and lively as long as possible. 1800 Flowers return policy is divided into few different types of situations. When you need to change your order and not to cancel it, you need to email the 1800 flowers Customer Service team or you need to give a call at 1-800-227-5387. All these processes can be executed before the order has been shipped or is out for delivery. Before the product is delivered, is out for delivery or is shipped, 1800 Flowers will earnestly try to process your request. Both the mail and phone number are the same with 'Change Address' credentials. Both for the above 2, the confirmation documents should be kept at the arm's length. Return for already-delivered package it not within the application to the skim right now. Sharing is caring. 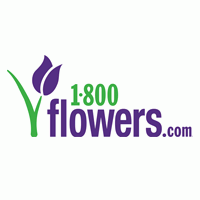 Submit A Coupon for 1800Flowers here.